Starting with an excellent introduction by kaiju-writer Jeremy Robinson, the opening of the anthology is quite a smashing one. If you’ve seen Pacific Rim and enjoyed it, then James Lovegrove’s very British story about Big Ben vs Red Devil hashing it out at a pier in Southern England is right up your alley. Its a somewhat simple story, but don’t let that fool you because its simplicity is what makes its great. David Annandale (one of the aforementioned authors I suggested for the anthology) then carried on with the story of the beast known as Eschaton as it rips through the city of Manchester and this one is full on man vs beast in a rather heart-warming way. The third opener is Peter Stenson’s story about a sea-kaiju who wants to make it big in Hollywood and be the star of his own franchise of kaiju films. Its a very unorthodox story and I loved the humour throughout. If not for the other great contributions here, this one might as well have been the best story in the anthology! And so on and on it continues. The middle of the anthology, populated with other known authors of various SFF genres, is similarly good/great. Some of the stories, a very very small handful didn’t quite click with me, either because of the characters or the plot or sometimes both, but overall, I had fun reading every story. There was never a moment when I wanted to give up on a story altogether. Never that. And I think that speaks to the editing skills of Nick and Tim. Tim especially has edited several anthologies previously, and he brings a lot of that expertise to the fore for this anthology as he guides Nick with his first editorial credit. I have to say that assembling all this talent is quite a stroke of genius because each story had something different to offer. Even when they had the same basic plot, the authors always went in different directions and they kept things really interesting. Howard Andrew Jones, J. C. Koch, Mike MacLean, Jonathan Wood, Jaym Gates, Peter Rawlik, James Maxey, and Josh Reynolds (the latter another author I recommended), all have to be credited as writing some of the most entertaining stories in the anthology. Josh’s story actually ties in to his St. Cyprian stories which he has had published in other venues and is the first of his non-Black Library work that I’ve read, and which I loved as well. His story is one of the other non-orthodox ones, in that the kaiju presented is nothing like you can have imagined. And with the others, some of the defining elements were their characters, especially James Maxey. That was another absolutely hilarious story, and a really fast paced one. It tied together religion and urban history in a really interesting way. Kickstarter Promo Cover. Dan Howard. The close-outs of the anthology are the trio of Larry Correia, C. L. Werner and James Swallow. For readers of this blog, you will know that I’m a huge fan of Herr Werner, all through his work for Black Library for the Warhammer Fantasy and Warhammer 40,000 universes. And similarly for James. They are both authors I recommended for this, and I’m really stoked that their stories were in the closing and were so good to boot. 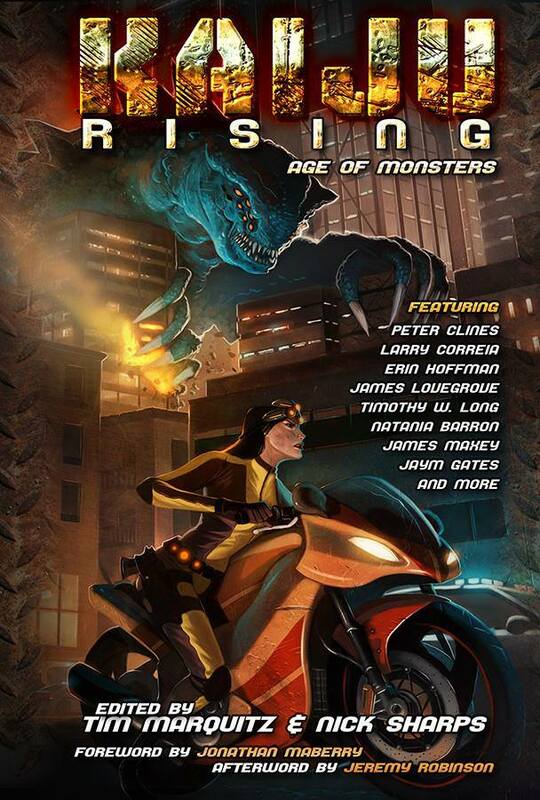 In fact, James’ story is a tie-in to Colossal Kaiju Combat from Sunstone Games, an online game that is currently under development. SG were kind enough to lend some support and the results are fantastic I have to say. And of course, Herr Werner is a kaiju mega-fanatic and his story more than lived up to my expectations of it. All in all, everyone involved in the making of this anthology, the authors, the editors, the artists, everybody, they did a great job. 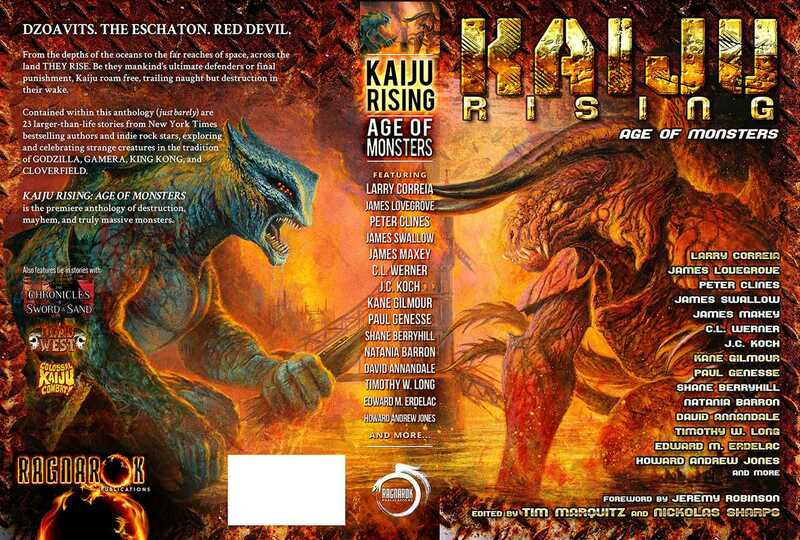 Each story is bookended with a special illustration (done by either Robert Elrod, Chuck Lukacs, or Matt Frank) that shows off the the kaiju involved in the story. This was part of a special tier that was unlocked during the kickstarter and the artist certainly delivered on the promise. It was a great aid to see how the monsters were supposed to look after reading the corresponding story. This anthology has really made me want to read and watch more kaiju fiction. I really, really want to watch the original Japanese kaiju movies. Herr Werner has certainly recommended quite a few to me, and when I do end up starting on them, I’m afraid it will be a monster binge. To be perfectly honest, I really can’t wait for that. I’m a huge fan of Pacific Rim and I’m really excited that Guillermo del Toro has begun work on a sequel. Plus, in a few short months we will have the king of kaiju, Godzilla himself, return to the big screen in a new movie, and that I’m super excited about. Posted on February 5, 2014, in Book Reviews, Review Central and tagged Bonnie Jo Stufflebeam, Book, Book Review, C. L. Werner, Charles St. Cyprian, Chuck Lukacs, Colossal Kaiju Combat, D. L. Seymour, Dan Howard, David Annandale, Edward M. Erdelac, Erin Hoffman, Fantasy, High Fantasy, Historical Fiction, Howard Andew Jones, J. C. Koch, J. M. Martin, james lovegrove, James Maxey, James Swallow, Jaym Gates, Jeremy Robinson, Jonathan Wood, Josh Reynolds, Kaiju, Kaiju Rising: Age of Monsters, Kane Gilmour, Larry Correia, Matt Frank, Mike MacLean, Monsters, Natania Barron, Nathan Black, Nautical Fantasy, Necromancy, Nick Sharps, Patrick M. Tracy, Paul Genesse, Peter Clines, Peter Rawlik, Peter Stenson, Ragnarok Publications, Review, Review Central, Robert Elrond, Samurai, Science Fiction, Sean Sherman, Shane Berryhill, Strange Beast, Sunstone Games, Tim Marquitz, Timoty W. Long, Urban Fantasy, Urban SF. Bookmark the permalink. 1 Comment.